Come and eat great homemade food in our friendly country café or ‘grab a bite’ from our Little Red Pie Shed for that outdoor experience. Be tempted by a range of distinctive gifts with a Scottish twist and amble at leisure in our beautiful 80 acres of deciduous woodland. 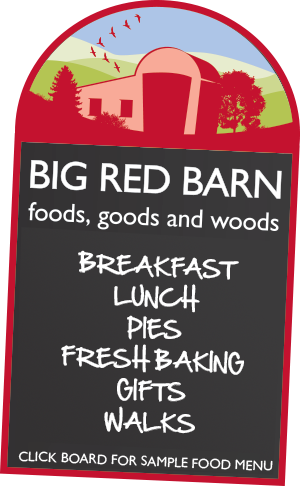 Conveniently located at the crossing of the main Edinburgh-Biggar and Glasgow-Borders cross country routes the BIG RED BARN looks forward to welcoming you with foods, goods and woods. Whether you fancy some hearty home-made food before or after exploring in the woods, or something To Go you will be well catered for at this friendly spot in the heart of the countryside. We serve breakfast, lunch and tea in the café or if you are on the go or like the fresh air wander over and grab a tasty pie at the Little Red Pie Shed. We have taken great care in selecting our coffees and teas and in our variety of delicious cakes made both here and by our friends at Garvald West Linton Bakery just up the road. Food to suit all special dietary requirements is available too! Seek out a present for someone special or treat yourself from our original selection of gifts, sourced from some talented Scottish producers. Safe off-road parking, easy wheelchair access, immaculate restrooms, a stunning location and a relaxing experience await in this contemporary conversion of an old cow barn. Stop by any time from 10am to 5pm every day of the week. Parking for cars, motorbikes and minibuses (max 18 seater). Sorry we are unable to take larger coaches, HGVs and Lorries. Please do phone us the day before your visit if you are a group of 6 or more to ensure we can provide the best service for you.